I have gone through many different styles: punk, bohemian, conservative and now I am back to laid-back. As spring is coming, I want to wear more colourful things. Estonians have alright styles. Less than a week ago I noticed that Heidy Purga is very stylish. Recently I have been into Afro-American style and Bob Marley’s hats. Obviously, I like to wear different colours. I am a sort of hippie, but not completely. I love shopping at second-hands in Tartu and I have some incredible friends who give me things. They have also great styles and inspire my own. Piia-Berta: I like very simple and basic pieces that can be combined with everything and always look good on you. At the moment I like to look pictures and movies with classical beauties. They are very dramatic and very inspiring, for example Marlene Dietrich. Helen: Essential for my style is wearing white sneakers. At the moment my style is affected by my friend. I think films are a great source for inspiration. 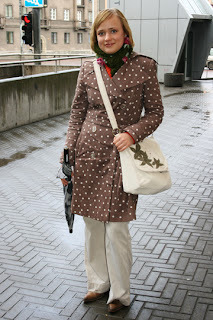 If I see something stylish or interesting in films, then next day I want to wear something similar. Fashion and clothes have to be natural. If I look into a mirror, I want to recognize myself. I don't understand that bling-bling mania amond young people, but I guess they are braver than I am. If I dress like that, I feel as I were going to a carnival. As long as I remember I have had this style. 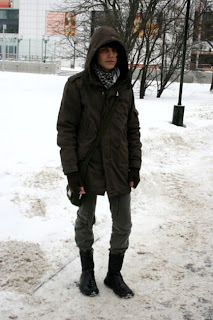 I like grey and black and comfortable clothes- very simple! I buy my clothes from ordinary shops, but I try to find these pieces that show my personality. 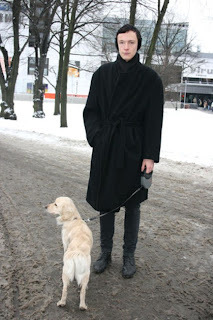 I really like that Estonians are not afraid to wear interesting details anymore! Style choices become braver and braver. I like to combine high-street clothes with designers’. My favourites are Tommy Hilfiger and Calvin Klein. I like clothes that are stylish and have good cuts. It is important that menswear would have a great quality too. I like the recent trend of skinny jeans on men. I can't understand men, who don't pay attention on what they are wearing, e.g. you can see men in suits wearing sneakers. My style is bohemian-punk and largely affected by my group of friends. I like shopping in small shops in the Old Town. I draw sketches of clothes I’d like to have and then try to find something similar. Helena: I really like fashion. I simply adore Nicole Richie's style and I frequently browse different Vogues and other fashion magazines. I buy my stuff from Germany and Italy. Fashion has to make me feel free. Tiiu: I, on the other hand, don't care so much about fashion. I am doing my own thing and happy for that. Literature is very inspiring, especially historical novels and Russian fairy tales, for example Śnegurochka is very stylish. Speaking of real people, Catherine Deneuve is one of my style icons. I also look through the collections by Noir and Viktor&Rolf, but I buy most of my clothes from second-hands. This coat comes from one in Nõmme. I try to keep a balance between alternative and trendy. At the moment I am into Siouxsie and the Banshees and I guess this can be seen in my clothes also. 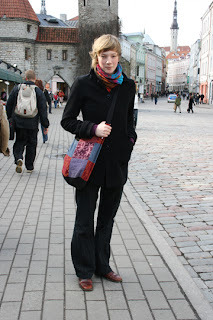 I never buy clothes from Estonian high-street shops, but I really like second-hands and vintage stores. If I go abroad, I try to invest in designers’ pieces, for example Vivienne Westwood is great. I am originally from Finland, but I have been living here for 2 years, before that I lived in England. So my style has become a mixture of everything. I like quirky yet feminine clothes. I really admire Milla Jovovich’s style. You need to find a balance between stylish and original and quirky. Very often people end up being just tacky. I make most of my clothes and I get ideas from my friends. 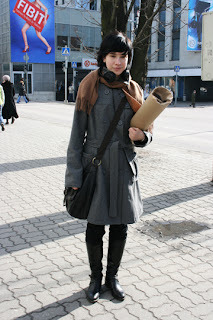 I like Estonian fashion and mainly read local magazines. Most of my clothes come from England. 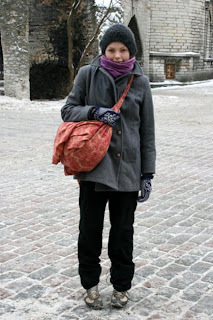 When I am in Tallinn, I prefer Vero Moda or Seppäla. I absolutely hate neon colours and usually wear darker and brown shades, but in summer I also try brighter colours such as blue and yellow. My idol is Angelina Jolie. We get most of our ideas from magazines and famous people. We really like Nicole Richie’s style. I think it is very easy-going and easy to resemble. We also seek inspiration from magazines like Bon and Cosmopolitan. As we both work in Lindex, we get many of our clothes from there. I am going through a dark period. Most of my clothes are black. I am studying sculpture in EKA and art is rather important to me. Inspiration has to come from inside not from other people. When I was younger someone told me that fashion is unnecessary flaunting and then someone said that fashion is as important as your personality. As a woman, I obviously believed the second one. I don’t care where I buy my clothes. It can be a second hand or Viru Centre. Person, who is wearing it, makes them cool not the place. My style is gothic rock and I get ideas from 70’s and 80’s music videos. I really like street style and have thought about making a similar site myself.